The Underwater World Singapore and Dolphin Lagoon at Sentosa offers visitors with a myriad of unique experiences where one can get up close and personal with selected marine life through the Touch Pool where you can touch stingrays as they swim by. There is also an open pool of baby sharks nearby but note the warning signs and the extra glass layer protection around the pool – don’t put your hands in there :-). The Underwater World Singapore showcases a variety of corals, fascinating fishes through a 83-meter long transparent acrylic tunnel (travelator) which passes through a huge aquarium. You can choose to walk through this tunnel or be moved around the tunnel through the slow-moving travelator to enjoy a three dimensional view of marine life all around you in a natural environment. 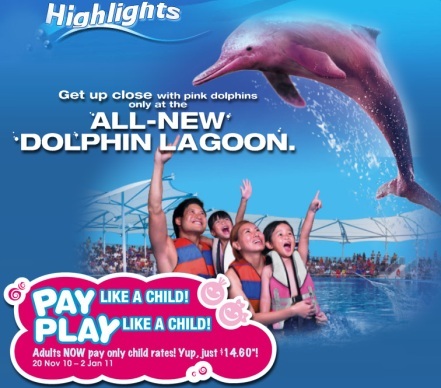 Another exciting part of the Underwater World Singapore has to be its seal and dolphin performances conducted every few hours by the Dolphin Lagoon (just a 2-minute walk away from the Underwater World aquarium – check out the video for a glimpse of what you can expect. This December 2010 school holiday (20th November 2010 to the 2nd January 2011), Underwater World Singapore is holding its the Carnival Sea-esta! – marine-themed carnival for the public where visitors are invited to enjoy carnival games from 1pm to 5 pm daily at the All-new Dolphin Lagoon, for a charitable cause. Underwater World Singapore’s belief that all children should be given the chance to pursue their dreams. The proceeds from the carnival game coupon sales will go to The Business Times Budding Artists Fund (BTBAF). The BTBAF aims to benefit children between the ages of 5 to 12 years distanced by socio-economic circumstances to pursue their aspirations to develop artistic talents in music, dance, theatre, visual arts and theatre production. Underwater World Singapore hopes to be able to raise S$10,000 to this fund. Besides having fun and contributing to charity, there is another reason to celebrate at Underwater World Singapore and Dolphin Lagoon. Adults enjoy an unprecedented offer from Underwater World Singapore where adult tickets are selling at the child rate (savings of about 50%)! * This promotion is available at Underwater World Singapore ticketing counters only. Valid for Singapore citizens, permanent residents and holders of employment pass, work permit or dependent pass with valid proof of identity. Only valid til 2 January 2011. Hi! Is this a paid advertisement for UWS or your personal trip? I hope you’d reply cause I’m doing a project on UWS. Your reply will help in forming the report. Thank you! Our visit to UWS was hosted by them but the review of what to see and do in UWS is strictly our personal opinion. We had high hopes for Underwater World and we were disappointed. It was ok in the 90s when I first went as a kid. The concepts are more or less still the same now (interact with fishes, lots of stingrays, the old school travelator with the aquarium on top) but it is very run down now and too warm. Its small, very cramped and the crowd was stifling. Way too many people crammed in there. Extremely rude and pushy tourists, made my experience unpleasant. You will be suffocated when touring with smelly and sticky people. I would recommend you not to visit on a weekend and perhaps consult the forums for advice on the quietest times/days to ensure you make the most of it and can see all displays. But better not to consider going there at all. The place is not well kept, Rockwork are falling apart, algae everywhere, sick and overly stressed fishes, parasite, you name it they have it. This is simply ridicules. I don’t understand how the whole place works. I saw lots of parasite in nurse shark’s eye and body, on grouper as well. Most area of its face was rotten and I could see those parasites crawling on it. And yet, they offered Dive with the sharks programme. Do they ever consider if these parasite were to get into the ear, nose or even throat of the participants. Would it create a big havoc inside? And how are the fish suffering. Or their only goal of every “attraction” is to just get money out of you. Money is NO. 1, others are just secondary and expandable. The dolphin and seals show was just average. The tricks were repetitive. Food and drinks were at 5 star hotel prices, but you have to eat it under the hot sun or rain, standing. Worse of it, the burger I bought does not seem to be freshly cooked. Its look and taste more like leftover over the last few days. It was an absolute waste or money and I wouldn’t recommend it to anyone! NEVER!!! gosh! 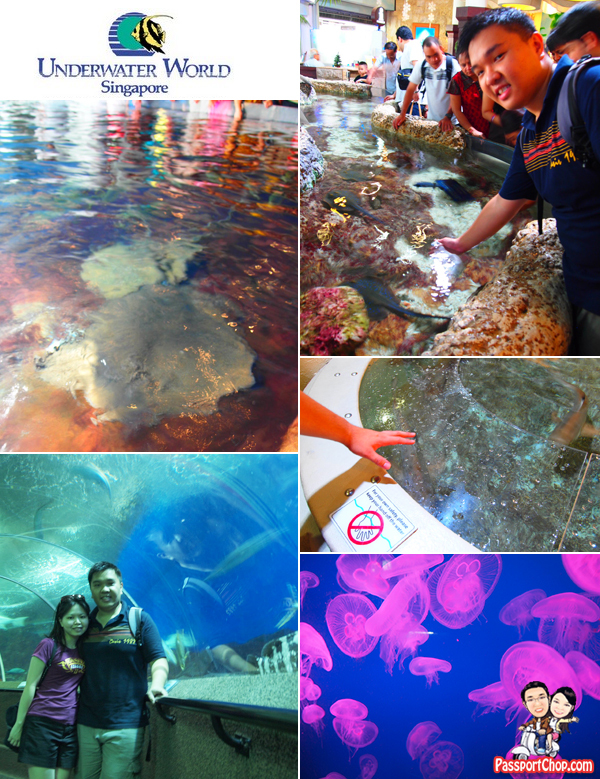 from your feedback – seems like Underwater World Singapore has changed a lot since our last visit in 2010! thanks for sharing – hope that the UWS people can look into how they can improve the attraction (especially now with increased competition from the Resorts World Sentosa maritime attractions).